Read a book to your baby. Digging into what these perks actually mean is what got me, though. Let’s take them one at a time. Read a book to your baby. Yes, reading to your baby is a good thing. But where are your eyes when you are reading? On the book. NOT on your baby. When you are feeding a baby, especially a newborn, it is very important to pay attention to their cues and signals. Is the flow too fast? Do they need a break? When the bottle is tilted continuously like this contraption does, the baby does not have control over the flow of the milk, so the milk can flow more quickly than your baby can swallow, increasing the risk of choking or aspiration (liquid in the lungs). 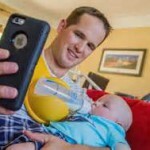 If the baby falls asleep while the bottle is still in her mouth and you aren’t looking at her (because you are reading a book or looking at the TV/phone), she is at risk for aspiration as well because the milk keeps flowing into her mouth and she isn’t actively swallowing. Making the feeding the priority creates the opportunity to observe and be responsive to the baby and his needs. Talking to your baby while you feed him is arguably just as calming as reading a book to him. The eye contact that occurs during infant feeding is vital to the attachment process; as the baby looks at you, they are learning your face, mirroring your facial expressions, and making a strong connection to you. The next one- answer the phone. In this day of constant connection, it is hard to stay away from the phone. In my experience as a feeding therapist evaluating babies who are struggling to feed well, though, I see how important it is for new parents to pay attention. When the baby feeds well at first but problems show up mid-feed or toward the end, it may be hard to recognize. 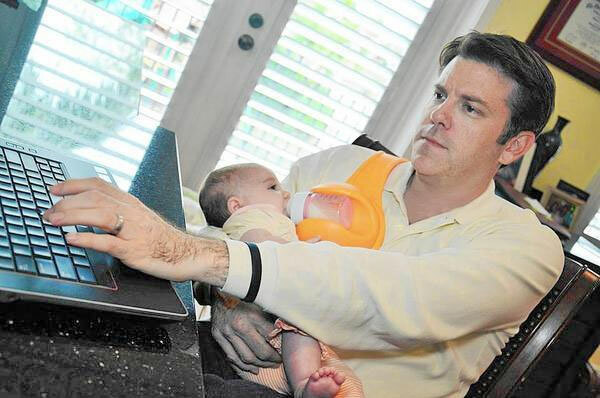 Having all of your attention on the baby while she feeds gives you the best chance to identify any problems. 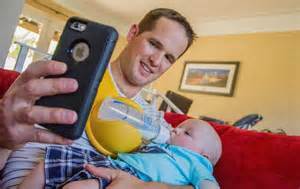 Needing to answer the phone while you are feeding a baby may happen from time to time, but usually that call can be returned when you are finished. It seems to me that if you have something over your shoulder that is, in essence, feeding your baby for you, you are bottle propping and you don’t have to pay attention to the baby. Making something easier doesn’t necessarily make it better, and in this case, I believe this device can actually make feeding worse. I’m sure many parents would love this device and obviously, the investors on Shark Tank thought it worthy. On the surface, it seems like a life-saver for our multi-tasking world, and Ashton Kutcher (I missed where he became a parenting or feeding expert?) apparently agreed. For me, however, it doesn’t make the cut.